By now, you’ve probably heard a thousand times that nuts are a healthy snack and offer many health benefits that your body needs. However, not all nuts are created equal, and there are so many types of nuts to choose from. In this article, we’re looking at the various types of nuts that you’ll find at the market today and which ones are the healthiest nuts to choose based upon your needs. Almonds are definitely one of the healthiest all-around nuts because they are rich in vitamin E, magnesium, vitamin B2, and manganese. They contain a good balance of fat, carbs, and protein and are known to help regulate blood sugar. Walnuts are very common nuts that have a wrinkly appearance and are frequently used in recipes. They contain significant amounts of manganese, copper, magnesium, and B vitamins. These nuts have been studied for their ability to lower blood glucose, decrease blood pressure, and positively affect brain function. Cashews are a popular type of nut that is affordable and easy to find in stores. These nuts contain significant amounts of copper, manganese, and magnesium, among other nutrients. Just be aware that many people are allergic to cashews and that cashews have a higher carbohydrate content compared to other types of nuts. Synonymous with southern cuisine, pecans are higher in calories and fat than most other types of nuts. They are sweet, often used in desserts, and have shown in research studies to help balance cholesterol levels. However, pecans contain high amounts of omega-6, which isn’t nearly as healthy as omega-3 fatty acids. Pistachios have become one of the most popular modern nuts thanks to extensive advertising campaigns. 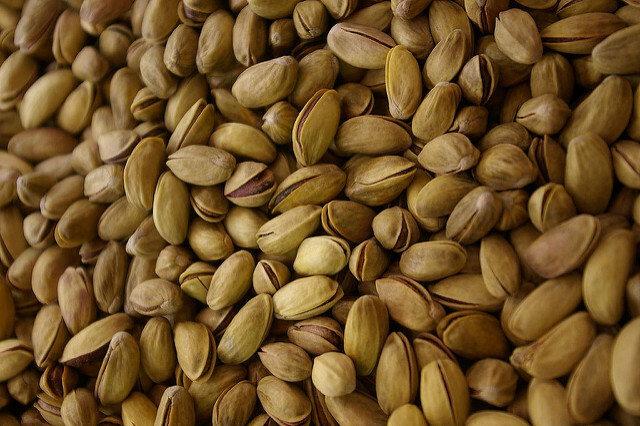 These nuts typically require you to break the shell open to eat them, and studies have linked pistachios to enhanced exercise performance and oxidative stress levels. Rather than loading up on Nutella or hazelnut lattes, it’s best to eat your hazelnuts raw for the health benefits. Hazelnuts are very rich in manganese and contain lots of copper and vitamin E too. They may be able help protect the body against cardiovascular disease and diabetes symptoms, and there really aren’t any major risks with hazelnuts unless you have an allergy. Macadamia nuts are rich and decadent, so it should come as little surprise that they also contain the most calories and fat per serving. In each one-ounce serving, macadamia nuts have about 201 calories and 21.2 grams of fat. Also, macadamia nuts tend to be the most expensive nut on the market shelves. Brazil nuts are large nuts that are a great source of selenium. They also provide the body with magnesium, copper, and phosphorus. Stick to only about a serving per week of Brazil nuts so that you don’t get more selenium than your body really needs. Pine nuts are less common for snacking and often used as a light topping for hummus and pizza. These nuts are an excellent source of manganese and also contain lots of vitamin K and copper. However, pine nut allergies can be very severe and even result in anaphylactic shock. If you’re watching your waistline, chestnuts are a good nut to snack on because they only have about 68.6 calories and 0.6 grams of fat per serving. But this also means that you’ll need to find your sources of healthy fats elsewhere, such as in avocados or fish. Also, the overall nutrient content of chestnuts is lower than that of the other nuts listed here. Honestly, peanuts don’t even belong on this list because they aren’t true nuts at all. Peanuts are actually a legume, which is a type of bean rather than an actual nut. Compared to true nuts, peanuts are much cheaper and contain far fewer nutrients. When buying mixed nuts, choose varieties with the fewest peanuts possible for the most health benefits. 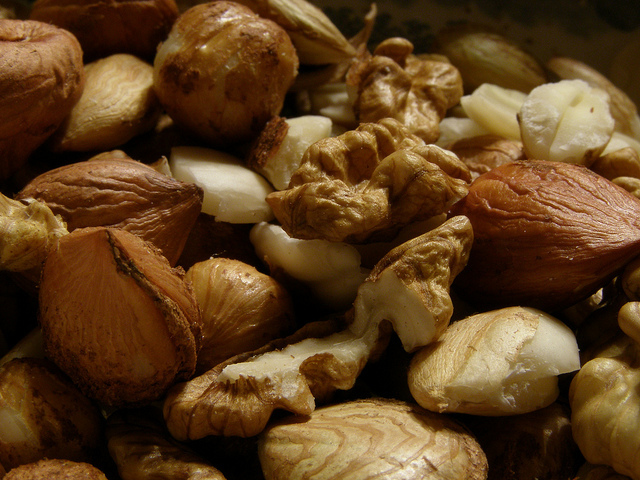 We hope you’ve found this comparison of popular nuts to be interesting and informative! Let us know what your favorite nut is and why in the comment section below.